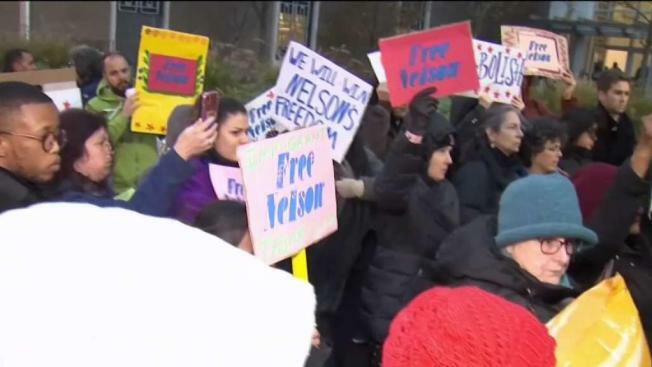 Dozens gathered outside the ICE office in Hartford Tuesday to show support for a Connecticut man facing deportation, who has spent nearly a year taking sanctuary in a church. Supporters of a father facing deportation rallied outside the federal building that houses the Immigration and Customs Enforcement office in Hartford Tuesday. They are asking for the agency to allow Nelson Pinos to stay in the U.S. and be with his family for the holidays. Pinos sought sanctuary at a New Haven church to avoid deportation to his native Ecuador nearly a year ago. He told NBC Connecticut he came to the US in 1992 for a better life and has lived in Connecticut for nearly 20 years. Supporters say he’s been paying taxes with a social security number issued to him by the government more than 20 years ago. Last month Pinos’ attorney submitted an appeal for a stay of deportation – citing the psychological harm this ordeal is causing his children. U.S. Sen. Richard Blumenthal (D-Conn.) met with the family this past weekend. Supporters say the situation has been emotional for Pinos’ family. “The children have been suffering tremendously by being separated from their family their father so we're here to celebrate the children and to let ICE know that it's really important. We're coming up on the holidays and families belong together and we're here to hopefully let them hear our message,” said Charla Nich, a member of CT Shoreline Indivisible. ICE says Pinos continues to evade immigration enforcement by staying at the church, which is considered a sensitive location and a place the agency will not enter to enforce deportation. The agency says while Pinos has a legal appeal pending in court, there is no change in his status as of this point.